A benefit for research on fighting Huntington’s disease in honor of late Creatures of the Golden Dawn pointman Mark Smith. There will be a silent auction taking place. Please get in touch if you wish to donate for the auction. Musically and culturally-related items only please. 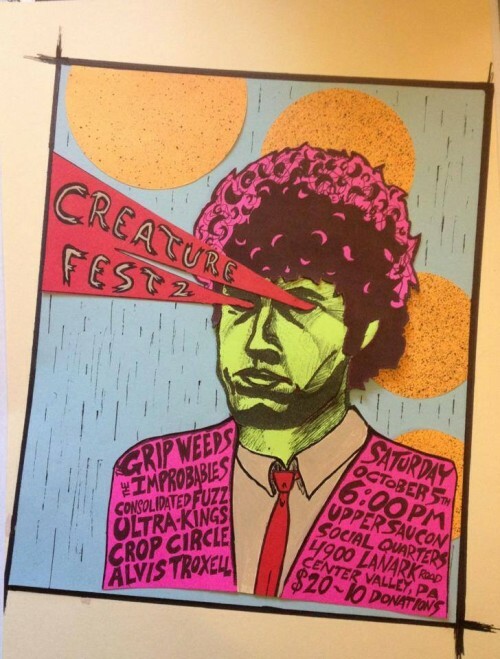 CreaturesFest was held on July 21 of this year, in honor of Mark Smith, the lead singer of the band The Creatures of the Golden Dawn, who passed away from Huntington’s Disease in 2011. Proceeds from the show which which happened at the North Penn Gun Club in Trumbauersville, PA benefited the PA Chapter of Huntington Disease Society of America. Upon entering the concert room one was confronted with an array of photos of Woody Guthrie and photos of his writings in honor of his 100th birthday. Woody died in 1967 from Huntington’s Disease after spending the last 10 years of his life in hospitals. In tribute to Guthrie, the show began with two great acoustic duos, Mike McMillan with Laurie Ann Hollinger, and Doug Ashby with Danielle Lubene, performing a sampling of Guthrie’s brilliant songs. Next the new group House of Fire with ex-Creatures of the Golden Dawn Mike Vallone presented a set of scintillating psychedelic with long drones and slow tempos, sounding in part like 1967 era Pink Floyd. The next group to play, Consolidated Fuzz, are the guys that were in Mark’s last line-up of The Creatures; with JT on vocals and lead guitar. They performed a terrific set which included garage classics like: “It’s The Same All Over The World” and a retro surf instrumental dating back over 25 years to the very first days of The Creatures, They also performed more recent Creatures songs. Wormwood Scrubs, with former early 90s Creatures lead guitarist Steve Schlack also presented some garage classics such as: “Love Is A Beautiful Thing” by The Young Rascals, “I’m Not Like Everybody Else” by The Kinks, and “Last Time Around” by The Del-Vettes as well as some classic Creatures songs from the 90s. Finally, The Insomniacs from New Jersey, who often played at The Funhouse in Bethlehem, closed out the show with a rousing set of The Jam influenced garage rock. Of course this was a Memorial for a very sad set of circumstances – CreaturesFest honored the life and tragic loss of Mark Smith, someone who through music, brought joy into the lives of many near and far over the long span of 25 years. Also families from the local Huntington’s Disease Support Group were invited to attend and a clearly afflicted woman and her caretaker husband were seated at the front table. So this was not your standard Saturday night sock hop. In all over 2K was raised and one hopes new breakthroughs in research will soon lead to a cure for this neurological disorder…. There will be another CreaturesFest – to continue in helping raise funds for the Eastern Pennsylvania Chapter of the Huntington’s Disease Society of America, and keep Mark’s spirit alive – this will take place on October 2013. The First Annual CreaturesFest in memory of Mark Smith—lead singer of Lehigh Valley, Pa.-based band The Creatures of the Golden Dawn and advocate of the 1960s-inspired rock music genre known as “garage”—will be held 5 p.m. to midnight Saturday, July 21, 2012, at North Penn Gun Club, Trumbauersville, Pa. Proceeds will benefit the Eastern Pennsylvania Chapter of the Huntington’s Disease Society of America. Smith died from Huntington’s-related complications at age 52 in 2011. “A purpose of this premier event is to celebrate Mark’s life by featuring the music he loved. It’s also to raise awareness of Huntington’s Disease and to raise money for research,” says Scott Steinberg of Bethlehem, Pa., who is organizing the event with the help of a volunteer committee. “Funding research is important because Huntington’s tears families apart,” adds Gregg Smith of Wescosville, Pa., committee member and Mark Smith’s brother, noting that their mother also succumbed to the disease. New Jersey-based garage band The Insomniacs will headline. The event will also include live performances by the following bands, all of which feature at least one former member of The Creatures of the Golden Dawn: Consolidated Fuzz (Lehigh Valley-based garage); Strange Haze (New York City-based garage/psychedelia); House of Fire (Philadelphia area-based neo-psychedelia); and Wormwood Scrubs (Lehigh Valley-based garage infused with British invasion). Plus, other local musicians—Danielle Lubené (of The Danielle Lubené Band), Doug Ashby (of Tavern Tan) and Mike McMillan and Laurie Ann Hullinger (both of The SaddleTones)—will perform a musical tribute to Woody Guthrie, who died of Huntington’s Disease and whose 100th birthday is this year. In addition, CreaturesFest will feature a display of Woody Guthrie’s life and lyrics. A silent auction will feature CD box sets, gift certificates and original artwork. A raffle will feature T-shirts and CDs and the recetly released Creatures of the Golden Dawn LP. Food and drink will be available for purchase from the onsite kitchen and bar. A Lehigh Valley native, Mark Smith formed The Creatures of the Golden Dawn—formerly known as “The Creatures”—in the mid-1980s. Known for its monthly performances at The Funhouse, Bethlehem, the band also played venues in Philadelphia, New York City and as far away as Moscow. The band recorded several CDs of predominantly original songs, which are featured on Sirius/XM satellite radio’s “Little Steven’s Underground Garage,” a show produced by Steven Van Zandt of Bruce Springsteen’s E Street Band. 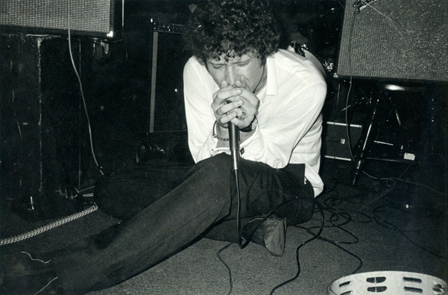 While the group endured many personnel changes over the years, Smith remained constant, continuing to sing, play harmonica, and write and record original music and lyrics until his death. Smith also hosted his own weekly “Exploding Plastic Inevitable” show on WLVR, 91.3 FM, the radio station of Lehigh University, Bethlehem. A limited-edition compilation LP titled “Dark Was the Night, Cold Was the Ground” was recently released on Los Angeles-based Dionysus Records. Huntington’s Disease is a devastating, hereditary, degenerative brain disorder for which there is no cure and only one FDA-approved treatment. Huntington’s Disease may affect cognitive ability and mobility; symptoms may include depression, mood swings, forgetfulness, involuntary movements—known as “chorea”—and lack of coordination. As the disease progresses, concentration and short-term memory diminish, and involuntary movements of the head, trunk and limbs increase. Walking, speaking and swallowing abilities deteriorate. Eventually the person becomes dependent for all care. Death can result from complications, such as choking, infection or heart failure. The event is sponsored, in part, by All That Salon, Emmaus, Pa.; The Compact Disc Center, Bethlehem; and Double Decker Records, Allentown, Pa.
2/4: Cacophony Society Pranksters Take Over Santa Ana! Doggie Diners – a Drunken Marionette? Bieno Svengali, a safe and sane family first performer (like legal fireworks) will perform his intoxicated marionette. Check out his court ordered letters from kids. On his way to Santa Ana, Charles Linvill parked his Asscar (that would be a car decorated with dog asses) overnight in front of the Motel 6 in Redding. The next morning, Asscar was completely covered in the motels finest linen due to numerous complaints. The maid delegation that met Charles at the car said they would pray for him. Charles reported improved gas mileage after their meeting. 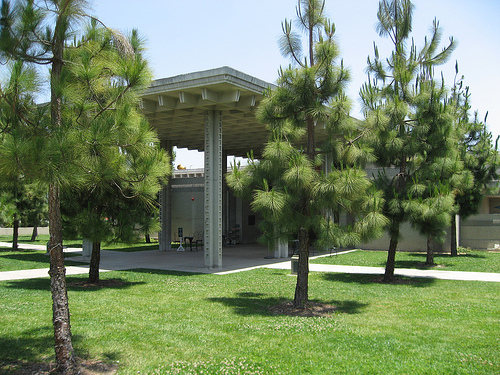 Tuesdays – Sundays 11:00 am – 4:00 pm. Extended hours: Friday & Saturday 11:00am – 7:00 pm. Final plans are in motion for the Auction and Party featuring more than 100 artists’ work to benefit the Los Angeles Municipal Art Gallery. Don’t miss this evening of creativity and fun with a mix of artists and creators, business, cultural, and civic leaders – all celebrating LAMAG’s legacy and its bright future. LAMAG is L.A.’s gallery and they need your support! To purchase tickets: Click here. To Preview the art works: Click here. All proceeds from the benefit and auction will go to support the gallery’s innovative exhibitions, stimulating special programs, provocative lecture and educational events, cutting-edge curatorial initiatives, and insightful catalogues and publications. Hors d’œuvres and wine are included in the price of admission. Music will be provided by DJ Colin Kim plus be on the look out for the Untitled Collective’s interventions that reveal (or conceal) layers of meaning and mystery. Sidney Felsen & Joni Moisant Weyl, Gemini G.E.L.